Transportation in Cuba is like nowhere else. Because of economic hardship and also due to the fact that private automobile ownership is very uncommon, transport has taken on it's own unique sights. For the tourists, modern world-class buses, taxis and rental cars are readily available, but for local Cubanos it is another matter entirely. 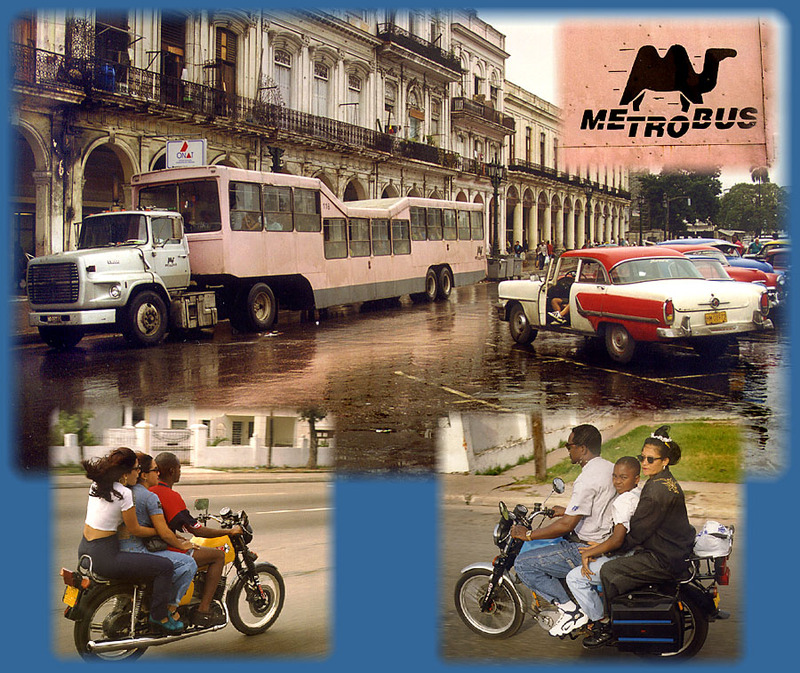 Pictured here in Havana is the ubiquitous El Camello (the Camel) Metrobus. The nickname is well deserved because of it's two hump appearance, but these large people movers solve the needs of mass transport very well. There is even camel artwork on the back of the busses (inset). One other very common mode of transport for Cubanos is via motorcycle, and you will often see whole families aboard these two-wheeled vehicles. The most I have ever seen was five people (two adults, three children) on one motorcycle. Not withstanding the age and state of repair of many vehicles, Cubans are well disiplined and courteous drivers with good road disipline.